Need a Staycation? Treat Yourself to a Weekend at The Redmont Hotel! 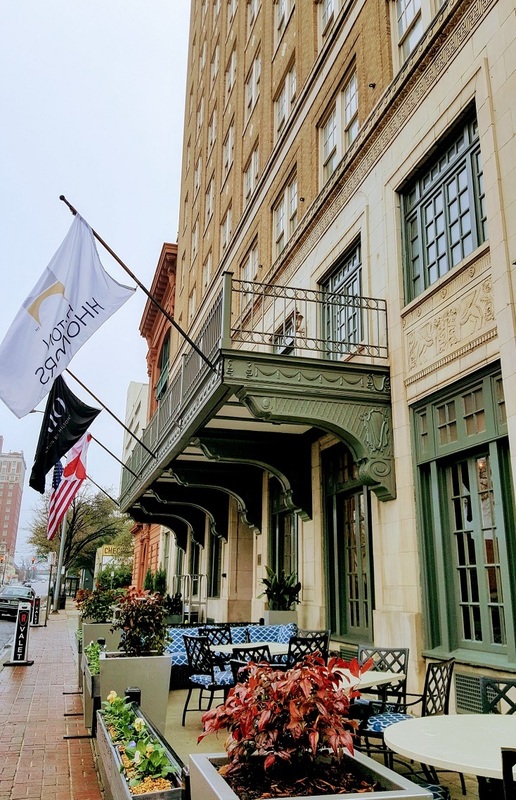 The Historic Redmont Hotel Makes for a Great Valentine's Day Staycation! Gazing out our hotel room window after a great night's sleep, we take in Birmingham's skyline silhouetted against the morning sun. It's a great way to start the morning. As we sip our coffee, church bells begin to chime their familiar melody reminding us that we have a schedule to keep and that time never stops moving. 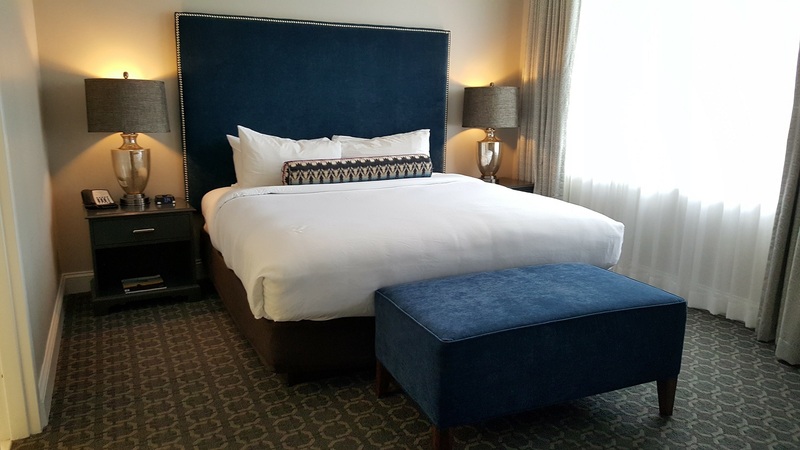 Our staycation was brief, but after just one night's stay at The Redmont we feel relaxed and ready to take on the day. Our first stay at The Redmont is etched in our memory. It was back in 2012 on our wedding night. We had a reception "after-party" on the rooftop and danced the night away with friends and family. While the history of the hotel was intriguing, the hotel itself wasn't all that fancy back in 2012. 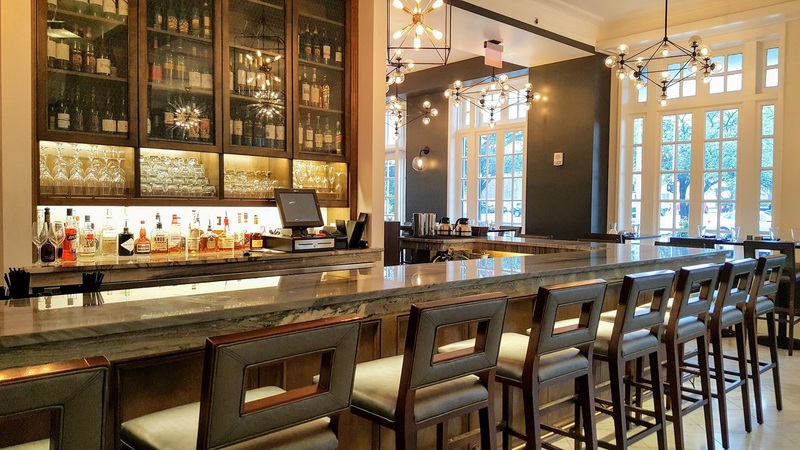 Four years, a total renovation, and a change of ownership later, The Redmont is a shining example of Birmingham's renaissance by providing a Five-Star experience while paying tribute to its historic roots. 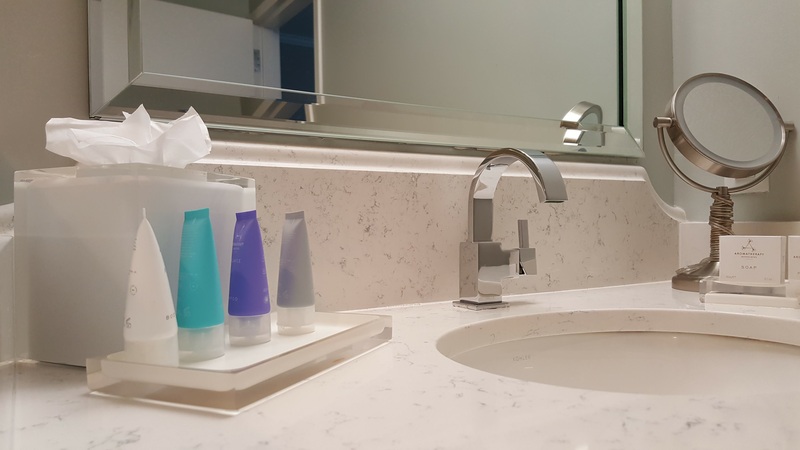 After hearing about our connection to the hotel, the staff invited us to experience all the great changes and upgrades through the eyes of a guest. 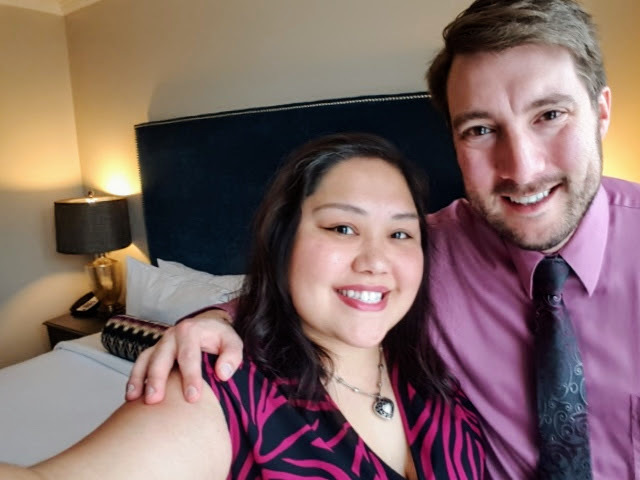 We had just celebrated New Year's Eve at "The Roof," the hotels rooftop bar, and jumped at the chance for a staycation! 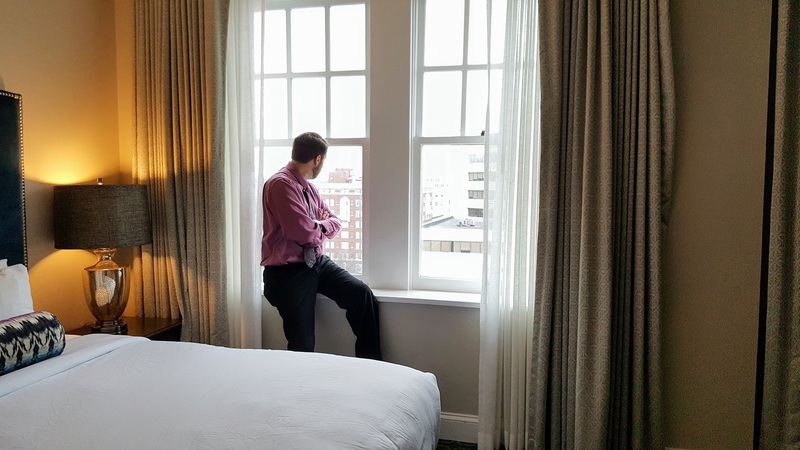 From the moment you pull up to The Redmont, you'll notice that it's different than other hotels in Birmingham. The bellhops have classic uniforms with button front red jackets and are more than happy to help with the check-in process. They will also valet your car! The exterior of the hotel looks like something you'd expect to see in early 2Oth century New York. When you walk though the doors, the 20th century look gives way to 21st century luxury. 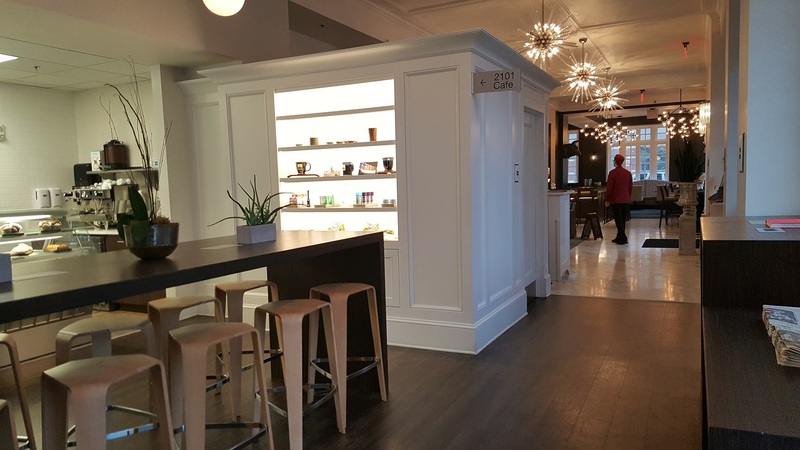 The decor is modern and trendy while featuring subtle nods to the hotel's history. You can even see the original mail chute between the two elevators on each floor! 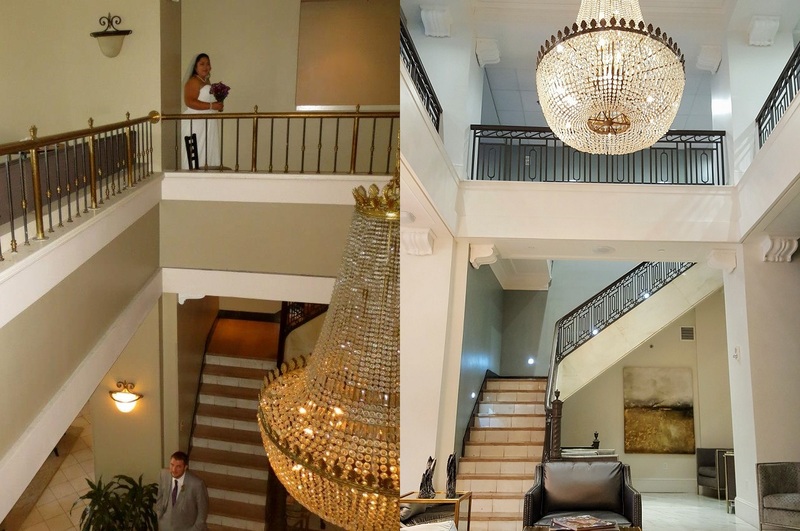 The entire building has the look and feel of somewhere that Zelda Fitzgerald would have stayed during the roaring 20's! Throughout The Redmont, you'll find framed black and white photos of buildings from around Birmingham that add to the local feel. 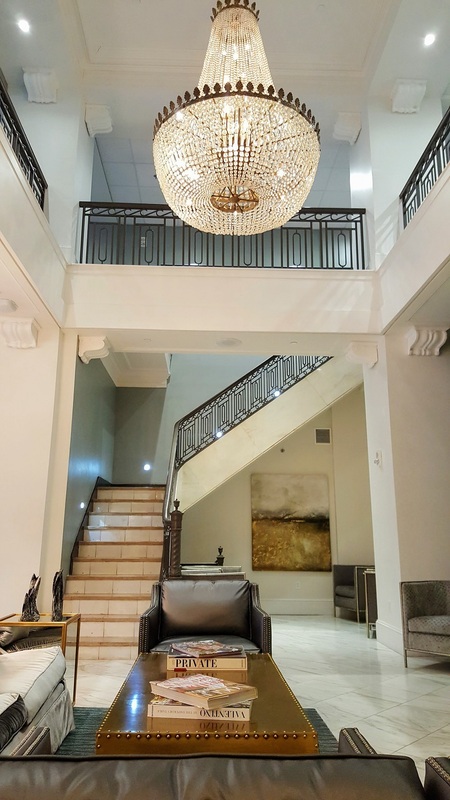 The marble floors and the grand staircase are the crowning features of the lobby's elegance. 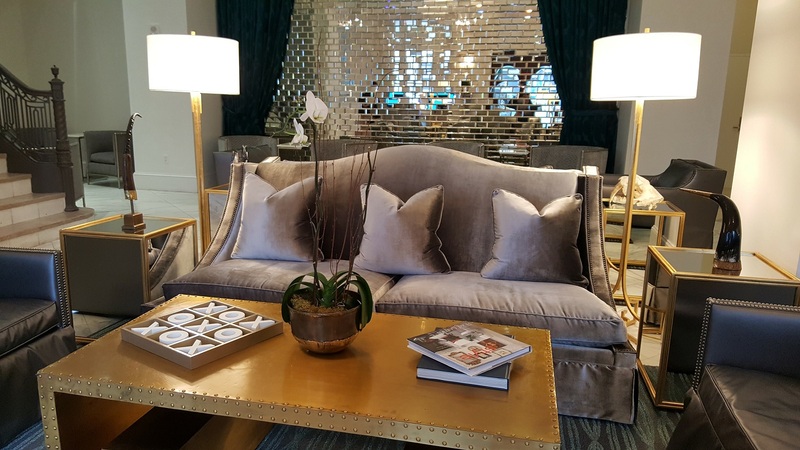 After checking in, we went up to our room on the 11th floor and were amazed at the amount of detail that was considered when designing the room. Our eyes were immediately drawn to the blue velour headboard which serves as a great accent piece to the room. The pillows on the bed are extra plush and make you want to stay in bed all morning. In front of the windows we found a desk equipped with everything one might need to take a business call, jot down notes, set up a laptop, or even post to a blog. There's also a single serving Keurig coffee maker if you're like us and need a cup of coffee or tea as soon as you wake up. The room comes equipped with multiple outlets with USB charging ports on them. This is always a plus for us since we have multiple mobile devices to charge. The bathroom is stunning! This particular one is lined with pristine white marble and has a glassed in, open air, tiled shower. There's not a shower curtain to deal with, just glass. 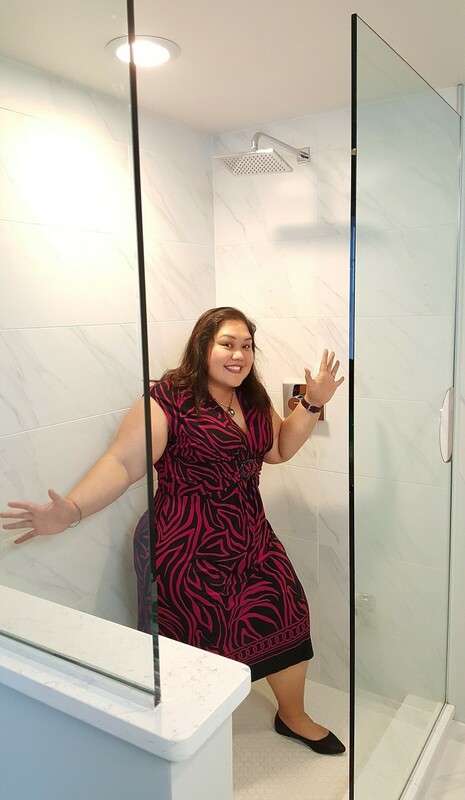 The shower features a rain shower head which can be turned on through a small opening in the glass so you can avoid a blast of cold water as it warms up. The bathroom amenities are by Aromatherapy Associates of London which we immediately googled after using! A lot of luxury hotels put store-brand shampoo in fancy bottles, but this stuff is spa quality! From the room we headed up to "The Roof" which opens at 4pm each day. It looks totally different from pre-renovation when it was "Above" and was more of a "nightclub scene" than an upscale atmosphere. Now The Roof has an upscale look and a layout that encourages you to socialize with friends and other guests. 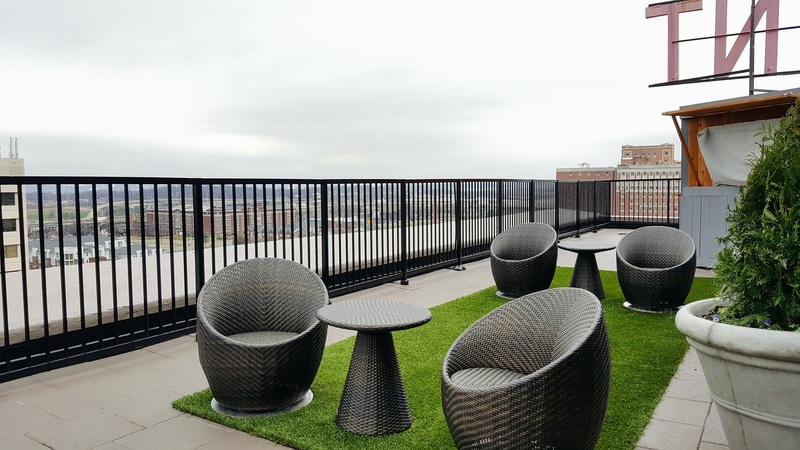 The rooftop balcony has plenty of seating and features ivy covered walls as well as green turf to cordon off the seating areas. This is fast becoming a popular Birmingham night spot, but is still a hidden gem for the Sunday brunch crowd. They open early on Sundays and you can bring games to play while sharing pitchers of mimosas and enjoying a great view of the city! We woke up the next morning and headed down to the lobby for breakfast. Since we have already eaten at Harvest we decided to try Cafe 2101. 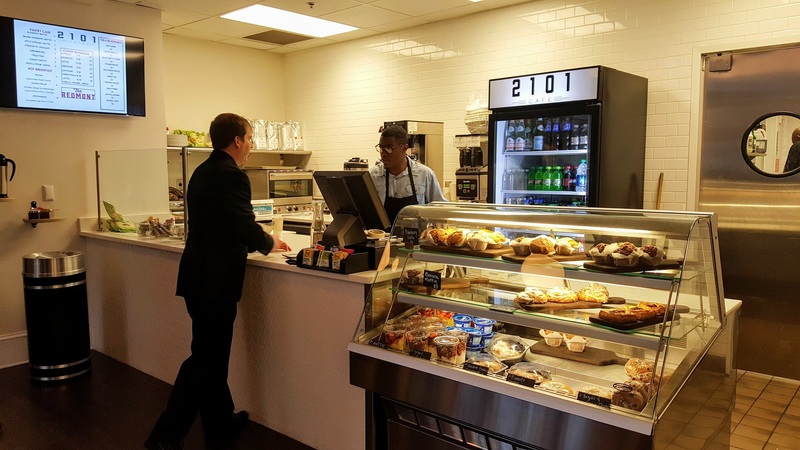 Cafe 2101 is open from 6am-2pm daily and features a number of breakfast options including parfaits, pastries, and even biscuits! The pricing is comparable to Panera, which surprised us given the great quality of the food! We ordered a Yogurt Parfait and a Sausage, Egg, & Cheese Biscuit along with some coffee. Every thing we tried was both fresh and delicious! 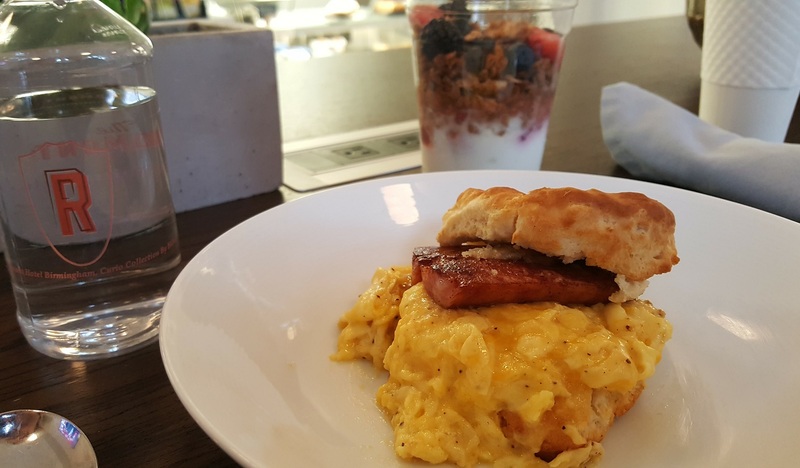 The Yogurt Parfait included freshly cut fruit and fresh granola while the Sausage Egg & Cheese Biscuit came on a warm soft biscuit, used real eggs and cheese, and was topped with a sliced smoked sausage link! It's also available with ham or bacon. While you can order specialty coffee, we opted for the regular 16oz coffee that comes with free refills. The refills are nice if you are reading the paper or working on your laptop. The top of the island in the middle of the cafe has hidden outlets and ports that are accessible at the press of a button! A shout out to our friends at Royal Cup for suppling The Redmont with their superb HC Valentine line of coffee! 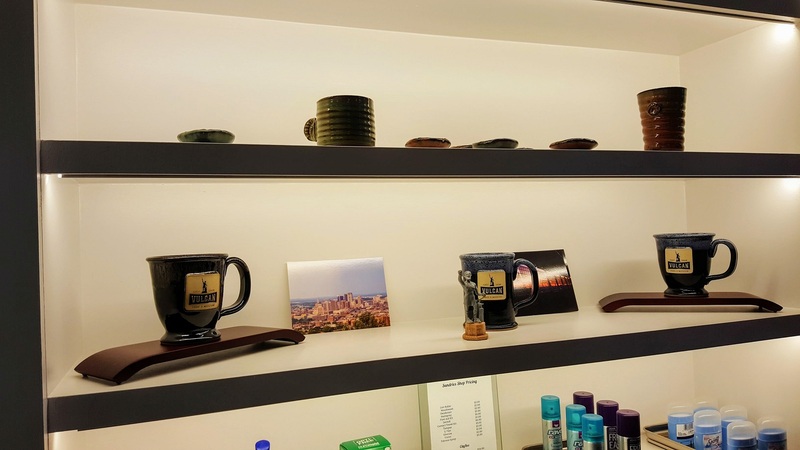 If you feel so inclined, you can even purchase a Vulcan Park & Museum coffee mug similar to the one you see in a lot of our Instagram posts! This allows out of town guests (or in-town staycationers) the chance to take home a cool Birmingham souvenir! 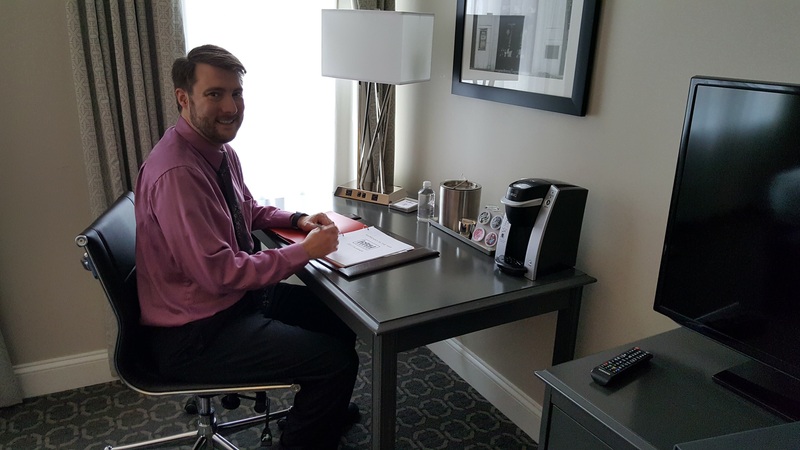 We had a fantastic stay at The Redmont and everyone we spoke with was extremely helpful and friendly. Only one employee recognized us as Happenin's in the 'Ham, so we were treated just like any other guests. If you are in need of a staycation (we're talking to you, parents) or if you have family coming to visit, they should definitely see if there's a room available at The Redmont! There's even a Zypbike station on the same block if you want to explore downtown! This Valentine's Day is a great opportunity to have a romantic getaway and enjoy a Valentine's Special that Harvest Restaurant is offering! The Redmont will always hold a special place in our hearts since it's connected with memories of our wedding day, which is all the more reason we are so excited to see it restored and operating at its full potential! 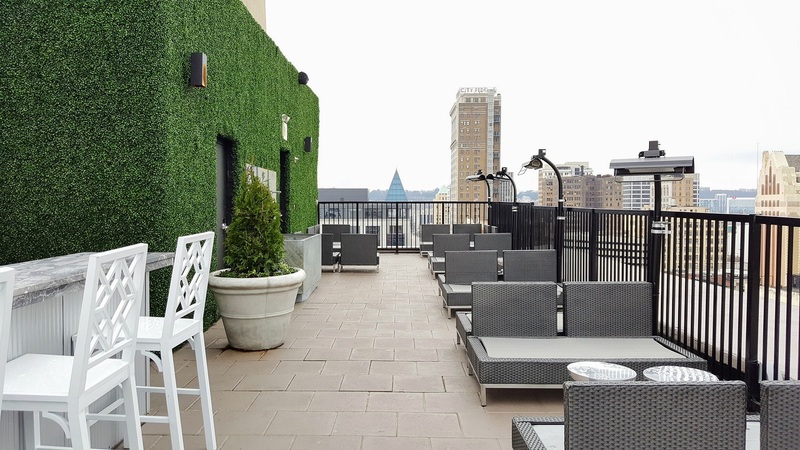 Even if you don't spend the night you should stop by for dinner, brunch, or cocktails on the roof so you can experience it in person! It's definitely nice to have them BACK in Birmingham!